31st day of the year with 334 days to follow (335 in leap years). 1865 The United States Congress passes the Thirteenth Amendment to the Constitution of the United States, abolishing slavery, submitting it to the states for ratification. 1865 American Civil War: General Robert E. Lee becomes Confederate general-in-chief. 1958 James Van Allen discovers the Van Allen radiation belt. 1961 Ham the Chimp travels into outer space as part of Project Mercury. 1971 Apollo 14 Mission – Astronauts Alan Shepard, Stuart Roosa, and Edgar Mitchell, aboard a Saturn V, lift off for a mission to the Fra Mauro Highlands on the Moon. 1995 President Bill Clinton authorizes a $20 billion loan to Mexico to stabilize its economy. 2010 Avatar becomes the first film to gross over $2 billion worldwide. 2018 Blue moon, blood moon and total lunar eclipse trifecta. 1) Jews don’t recognize Jesus as the Son of God. 2) Protestants don’t recognize the Pope as the Vicar of Christ. 3) Baptists don’t recognize each other at the bar on Saturday nights. OUR COLUMBIA, S.C., Army Reserve Civil Affairs Brigade was holding a joint exercise with troops from Fort Bragg, N.C. One soldier was assigned the task of finding civilian facilities in the area that could repair an armored division’s vehicles. He located three shops that were so equipped and then phoned a fourth one. ~ Law of Mechanical Repair: After your hands become coated with grease, your nose will begin to itch. ~ Law of Probability: The probability of being watched is directly proportional to the stupidity of your act. ~ Law of Gravity: Any tool, nut, bolt, screw, when dropped, will roll to the least accessible place in the universe. ~ Law of the Bath: When the body is fully immersed in water, the telephone rings. ~ Law of Random Numbers: If you dial a wrong number, you never get a busy signal; someone always answers. ~ Variation Law: If you change lines (or traffic lanes), the one you were in will always move faster than the one you are in now. ~ Law of the Result: When you try to prove to someone that a machine won’t work, it will. ~ Law of Close Encounters: The probability of meeting someone you know increases dramatically when you are with someone you don’t want to be seen with. Little Johnny’s new baby brother was screaming up a storm. A young airhead had the windows in her house replaced with new double-insulated energy efficient windows. Twelve months later, she got a call from the contractor, complaining that the work has been done for a year and she had yet to make the first payment. ~ If he asks if you knew how fast you were going, say no, my speedometer only goes to 70. ~ If he asks you to step out of the car, automatically throw yourself on the bonnet. ~ Trip and fall into him. ~ Accuse him of police brutality when he pushes you away. ~ Try to sell him your car. ~ Ask if you can buy his car. ~ Tell him you like men in uniform. ~ Ask if you can borrow his uniform for a Halloween party. The summer band class I taught was just getting underway when a large insect flew into the room. The sixth graders, eager to play their shiny new instruments, tried to ignore the buzzing intruder, but eventually one student could stand it no longer. He rolled up his music book and swatted the insect and then for good measure stomped on it to ensure its fate. “Is it a bee?” another student asked. – Eat well, stay fit, die anyway. – Men are from earth. Women are from earth. Deal with it. – No husband has ever been shot while doing the dishes. – A balanced diet is a cookie in each hand. – Middle age is when broadness of the mind and narrowness of the waist change places. – Opportunities always look bigger going than coming. – Junk is something you’ve kept for years and throw away three weeks before you need it. – There is always one more imbecile than you counted on. – Experience is a wonderful thing. It enables you to recognize a mistake when you make it again. – By the time you can make ends meet, they move the ends. – Thou shalt not weigh more than thy refrigerator. – Someone who thinks logically provides a nice contrast to the real world. – Blessed are they who can laugh at themselves for they shall never cease to be amused. TODAY IN TRIVIA: How old was Franz Schubert when he died? At the age of 31, Schubert died in Vienna, on 19 November 1828. The cause of his death was officially diagnosed as typhoid fever, though other theories have been proposed, such as syphilis with mercury poisoning from the treatment. ~ Where was Schubert buried? By his own request, Schubert was buried in the village cemetery of Währing, Vienna, next to Beethoven, whom he had admired all his life. In fact, he had served as a torchbearer at Beethoven’s funeral just a year before his own death. ~ Did Schubert produce many works in his short lifetime? Indeed he did! He was extremely prolific with over 600 secular vocal works (mainly Lieder), seven complete symphonies, sacred music, operas, incidental music and a large body of chamber and piano music to his credit. ~ What is a Lieder? It’s a type of German song, especially of the Romantic period, typically for solo voice with piano accompaniment. The words are from a German poem and are set to classical music. 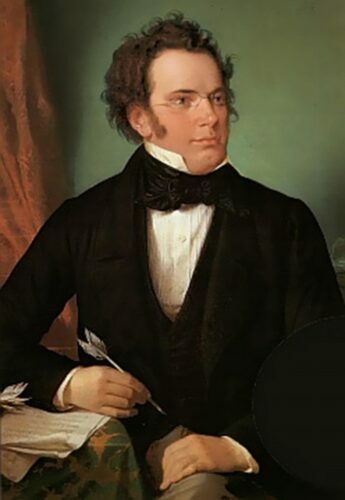 Schubert was the most notable composer of lieder.